The limestone forming the Batu Caves in Malaysia is suggested to be 400 million years old. The entrances to a few caves were used as shelter by the indigenous Temuan people. Now it shelters flocks of tourists every day from the Kuala Lumpur changeable weather. 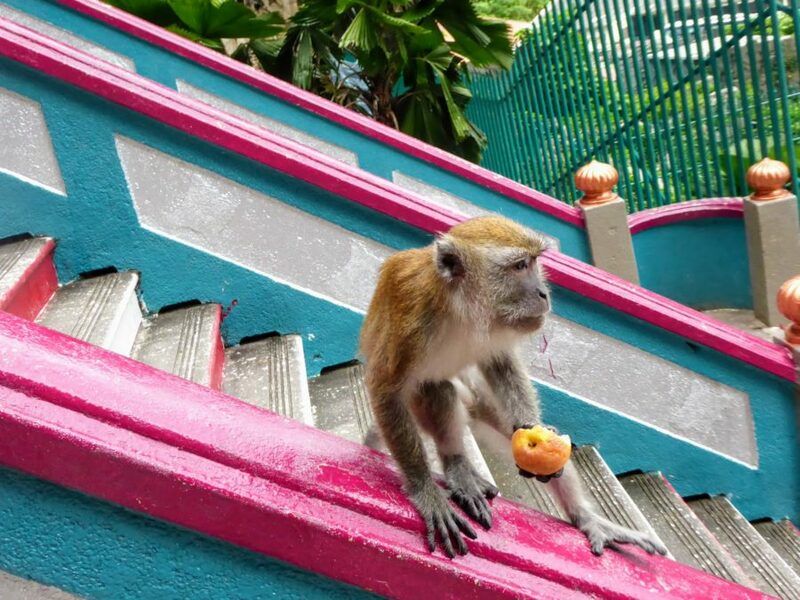 The 272 concrete steps up to the Batu Caves, KL does nothing to put off all the tourists. The beauty of the Hindu shrine does nothing to put off some of these visitors from dropping their rubbish. The place really was littered. 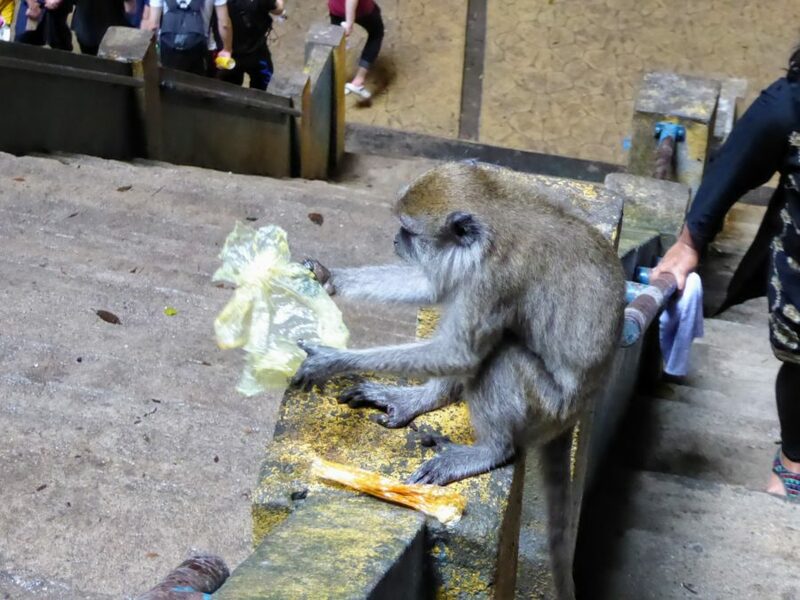 It was so sad to see some of the monkeys chewing on the plastic carrier bags. 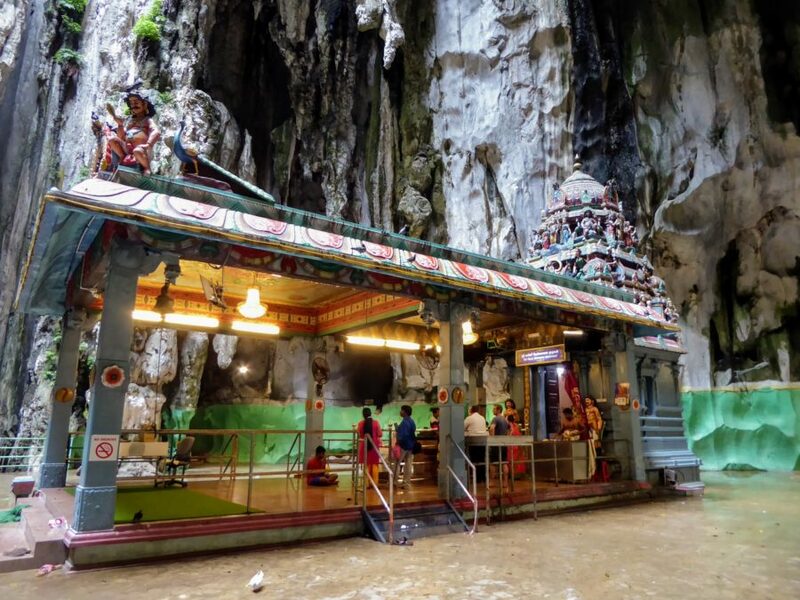 However once taking some time to let the next influx of crowds pass and taking the time to stand at peace in front of the shrine whilst Hindus hold a service, you could feel the uniqueness of the Batu Caves. The limestone hill also houses a number of other caves and shrines. You can also rock climb here as the Batu Caves have over 160 climbing routes. It is free to do if you have your own equipment. Have you visited any shrines in amazing places? Where have you been in Kuala Lumpur? Please comment below. Don’t forget to subscribe (It’s free!) to my blog for more posts like this and interesting travel tips. 1/ The caves are free to enter but some of the surrounding caves and shrines vary in price to enter. 2/ Do not enter with food, or if you do, keep an eye out for the monkey who will do a grab and run for anything they fancy. 3/ The best way to get to the Batu Caves is by train. It is clearly marked at stations around KL Sentral and costs RM4 for a return. You can also take bus 11/11d from Bangkok Bank terminus or U6 from Titiwangsa. We visited the Batu Caves as part of a tour – and had no idea it was so cheap to get there on the train! What a great tip! I also counted every one of those 272 steps and think I had to stop a couple of times to catch my breath on the way up (I’m so unfit!) but the view from the top looking out was worth it – and being able to visit one of the oldest Hindu shrines was something I’ll always remember! 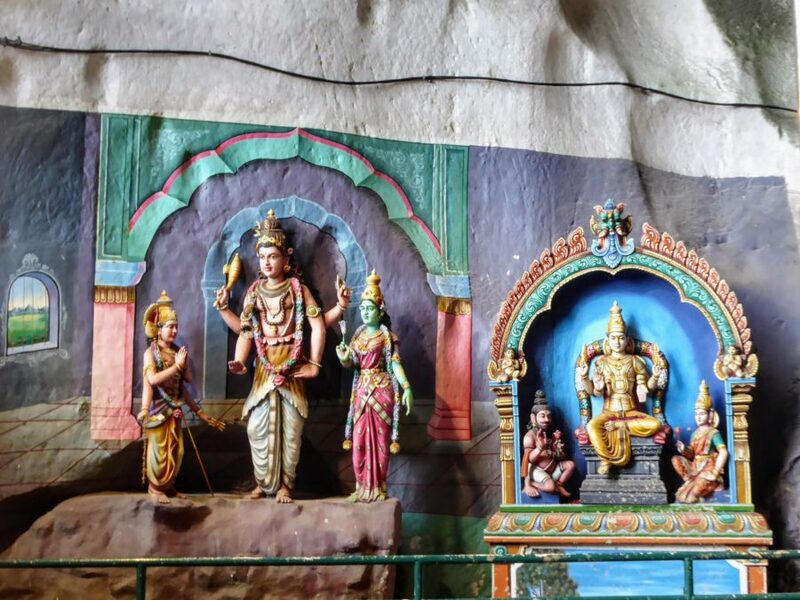 I am a Hindu and I am amazed that something like this exists in Malaysia. Hindu is primarily a religion in India and Nepal but as I am reading more, I am learning its spread is much more than what I had imagined earlier. I would love to visit this place. I never knew about Batu caves in Malaysia. Being a Hindu I would surely bookmark this page for reference in future. Moneys are very cute and even in India near temples you find monkeys.